This week I showcased new Muscle Milk Protein Smoothie Yogurt Shakes as a Daily Dose of Dairy. Made with Greek-style yogurt, this marks the first time the company can comfortably tout a Muscle Milk brand beverage as being made with real dairy. Read more HERE. The shelf-stable shakes come in 16-ounce plastic bottles in four varieties--blueberry, mango tangerine, peach and strawberry banana—and contain 25 grams of protein from the added yogurt, milk protein concentrate and whey protein concentrate. Because the beverage is heat treated after culturing, the cultures are no longer live and active and this is declared on product labels. This brand is all about full disclosure and transparency and is not going to take any chances with upsetting the dairy industry. It knows we play hard ball to protect our beloved milk. 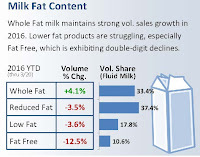 For those unaware of the brand’s testy relationship with the U.S. dairy industry, here’s a quick synopsis of what resulted after the dairy industry filed complaints with various regulatory agencies during the past decade. For all Muscle Milk products currently in distribution, the words Muscle Milk are now followed by the word “brand” on package front labels. Excluding the new yogurt smoothie line, the verbiage “contains no milk/includes milk proteins” is also prominently displayed on front labels. This is to prevent consumers from thinking that Muscle Milk is made with real milk. Others have learned from the brand. Rolling out this coming month is new MET-Rx Ultra Recovery High Protein Milk Shake. Available in chocolate and vanilla flavors, this post-workout protein shake has ultra-filtered milk as its number-one ingredient, enabling the beverage to claim it is “made with real milk.” It gets a protein boost from the addition of milk protein isolate, to deliver 30 grams of protein in every 11-ounce shelf-stable bottle. Dairy protein beverages for sports enthusiasts and athletes are coming from all types of food and beverage marketers, except, yes, you guessed it…dairy processors. There are a few players, most notably Shamrock Farms with its Rockin’ Refuel. Read more HERE. And fairlife has Core Power and Core Power Elite. Read more HERE. Recently, Dairy Farmers of America introduced Live Real Farms, an energy drink described as “made with real dairy and fruit juice.” The 11-ounce aseptically packaged shelf-stable carton lists fruit juice blend as the first ingredient. The formulation also contains lactose-free skim milk and whey protein isolate. Read more HERE. Made with real milk or not, non-dairy beverage marketers have definitely upped their game and are getting quite aggressive in the sports nutrition business using specialty dairy ingredients. Late last year, the PowerBar brand extended its sport nutrition know-how into the ready-to-drink sector with PowerBar Protein Shake. It contains the company’s proprietary protein blend of milk protein concentrate, calcium caseinate and whey protein concentrate. Each 14-ounce shelf-stable bottle provides 30 grams of protein. For more information, link HERE. 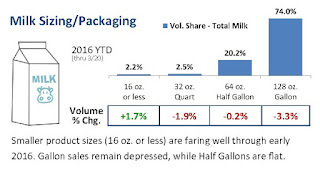 And just this past month, Atkins Nutritionals strayed away from the weight loss segment and entered the sports nutrition business with new Atkins Lift Protein Drinks. Available in three flavors--berry, lemon and orange--each 16.9-ounce bottle contains 20 grams of protein from whey protein isolate. It’s time for dairy processors to do more with the leading sports nutrition protein that has its origins in milk. It’s the WHEY to go in the beverage business. Many dairy processors have introduced great new products this past year and I encourage you to enter the World Dairy Innovation Awards 2016. U.K.-based FoodBev Media has organized and presented this award for the past 10 years, and this year will be selecting winners in 18 different categories ranging from products, brands and catering to marketing, packaging and sustainability. All are designed to celebrate excellence and innovation across every category of the global dairy industry. Every year, some of the biggest, most world-renowned brands and groundbreaking new start-ups enter the awards, highlighting their newest innovations on this global platform. The finalists and winners of the 2016 awards will be announced at a special gala dinner during the 10th Global Dairy Congress on the evening of June 28, 2016, in London. In 2015, the World Dairy Innovation Awards attracted more than 220 entries from 27 countries. This year, the closing date for entries is May 20, 2016. For more information and to enter, link HERE. I am honored, once again, to be a judge. There are nine of us this year. To hear video clips on what we will be looking for when selecting winners, link HERE. 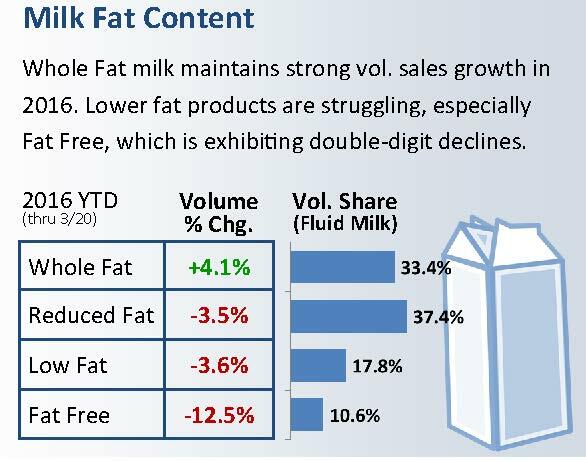 What many of you are doing to sell more fluid milk is not working. 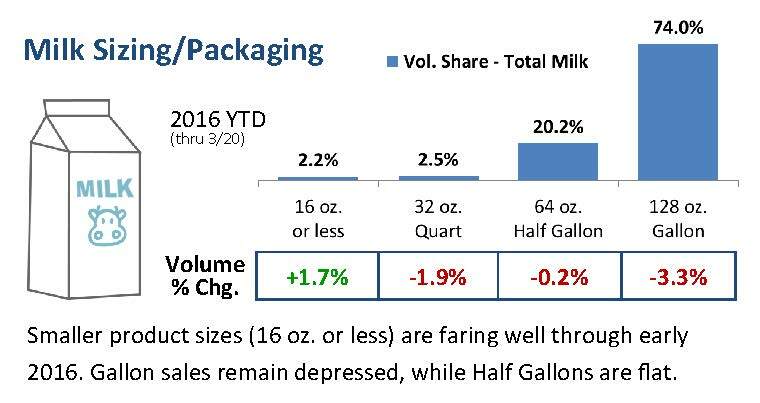 Volume sales continue to decline. 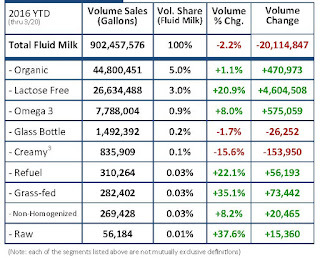 In my 23 years of writing for the dairy industry, I have never once written that milk consumption has increased. It is time to be proactive. According to the author, many restaurant menus have started citing the provenance of their dairy products, including fluid milk and creamer, in the same way they boast of grass-fed rib-eye steaks and hydroponic tomatoes. And consumers are willing to spend more for boutique milk at farmers’ markets and upscale grocers. At Whole Foods Markets nationwide, sales of grass-fed cows milk—much of it locally produced—have experienced “high double-digit growth during the past two years and will likely increase in 2016,” said Julie Blubaugh, the manager of local products for the company’s Midwest division. That surge is even more remarkable given the long slump in overall milk sales. Annual fluid-milk consumption has fallen to 159 pounds per person in 2014, from 247 pounds in 1975, according to data from the USDA. The fluid milk industry might just be ready for the small-batch, locally made, artisan trend that has hit everything from beer to chocolate to potato chips…and is quite successful in other dairy categories, namely cheese, ice cream and yogurt. Why not fluid milk? The reality is that the low wholesale price of milk has left many mom-and-pop dairy farms struggling. Millennial entrepreneurs who embrace crafted foods and customization are seeing something you, your dad and his dad did not see: Milk can be so much more. This is not your daddy’s dairy any more. We do not consume the way we once did. Only the foods that adapt to consumers’ evolving on-the-go, better-for-you, better-for-the-world and story-telling lifestyle will thrive. Innovators are embracing boutique, high-end dairies and see them as a lucrative niche in a tough market. The days of the all-you-can-eat low-budget buffets are gone. Millennials and the cohort of people born after them, Generation Z, which includes my two sons, are demanding consumers. This became very apparent this past week when I went on two college tours with my 10th grader, first to the University of Wisconsin-Madison and then to my alma mater, University of Illinois-Champaign Urbana. The dining rooms in the residence halls look like upscale restaurants. Though still cafeteria style, with Wisconsin having a pay for what you take format while Illinois still has an all-you-can-eat approach, the foods and beverages offered all tell a story. If it’s not the source, then it’s the nutrition. And when students dine on their own dollar on campus, they are going to cafes serving artisan and locally sourced products. These are young adults with an affinity for what they believe to be the best. This will not change. The milk industry needs to change. The time is now to design milk beverages to speak to the needs of Millennials and Generation Z. Organic, lactose free, omega-3, grass fed…this is what they want. Extra vitamins and minerals, refueling and preventative…these are attributes that will get consumers to buy milk. Smaller-sized packaging for on-the-go convenience as well as delivery of nutrients is key. Adding value is paramount. To read an article I wrote earlier this year for Food Business News on “Boosting the Nutrition Profile of Beverages,” link HERE. Check out this new product in Austria from Seifried. Vita Plus D3 Vollmilch Länger Frisch is a long-life whole milk characterized by a comprehensive health-related added value. Its story is that it will help strengthen overall well-being. The milk is enriched with vitamin C for immunity and vitamin D for healthy muscles, bones and teeth. This milk also contains added omega-3 fatty acids EPA and DHA. DHA contributes to the development and function of the brain and nervous system. Specifically, it is essential for brain development in infants and toddlers, as well as visual function and cognitive health throughout life. EPA plays a crucial role in promoting cardiovascular health and safeguarding the body’s cells and joints. In Russia, there’s new TH True Milk Phytosterol Fortified UHT Milk, which is said to reduce cholesterol levels and be good for the heart. According to the manufacturer, this milk comes from well-treated cows who listen to music, drink clean water and bathe every day. (Millennials and Gen Z love hearing this stuff!) The company also offers TH Top Kid, which is formulated for the nutritional needs of children ages 1 to 6 years. The formula contains DHA, and an array of other nutrients, including vitamins B, C and D to enhance immunity and support brain function. Need some milk innovation? Plan to attend the International Dairy Foods Association Milk and Cultured Dairy Products Conference May 24 to 25 in Indianapolis. For more information, link HERE. 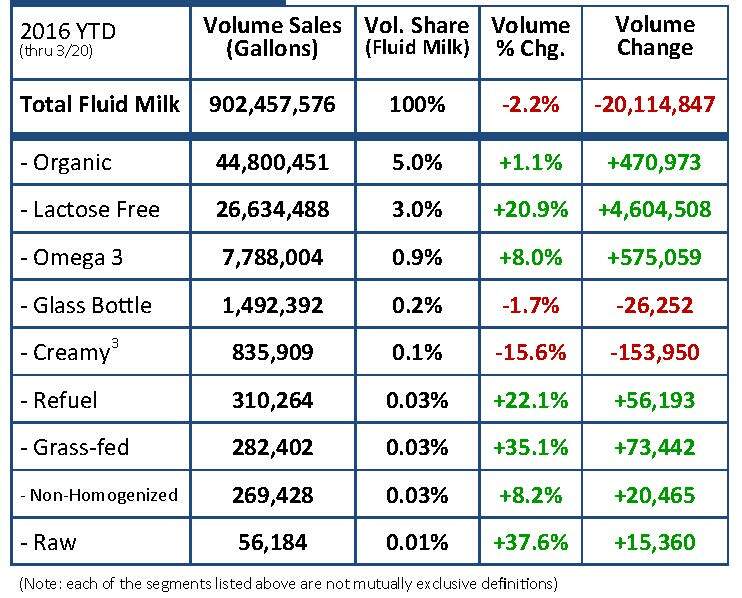 What a week for dairy! Between ice cream marketers gathering in southwest Florida to cheesemakers convening in Milwaukee, few dairy executives were in the office. It was a whirlwind of a week for many of us. According to presentations at both shows, the ice cream and cheese categories are thriving thanks to innovative new offerings and uses. With ice cream, culinary-inspired creations have made this frozen dessert category one of the top-10 trends in U.S. restaurants for 2016. With cheese, advanced technologies are enabling new forms and flavors of cheese, as well as new uses. My favorite mainstream media headliner this week came from Bloomberg in an article addressing how Taco Bell’s sales are growing five times faster than those of sibling company Pizza Hut, thanks in part to a new strategy focused on catering to Americans’ love of cheese. One such example is the company’s highly successful Quesalupa, which is the result of more than two-years of careful research and testing. It was specifically designed to cash in on an uptick in dairy-product consumption among U.S. consumers. That’s right! We are digging dairy and we are really loving cheese. Just last month, Little Caesars Pizza introduced limited-time Stuffed Crust DEEP!DEEP! Dish pizza. The new concept is an eight-corner deep dish pizza topped with cheese and pepperoni and surrounded by a unique, crunchy crust that is loaded with even more gooey, melted cheese. The new pizza boasts 75% more cheese than the regular DEEP!DEEP! Dish. 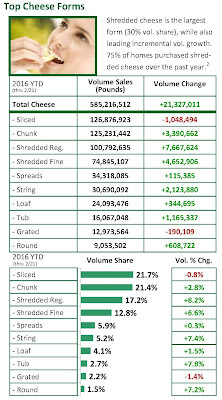 Consumers are starting to understand that not only is cheese delicious, it is a powerful way to get essential nutrients. This knowledge presents a great deal of opportunity in the snacking cheese category. 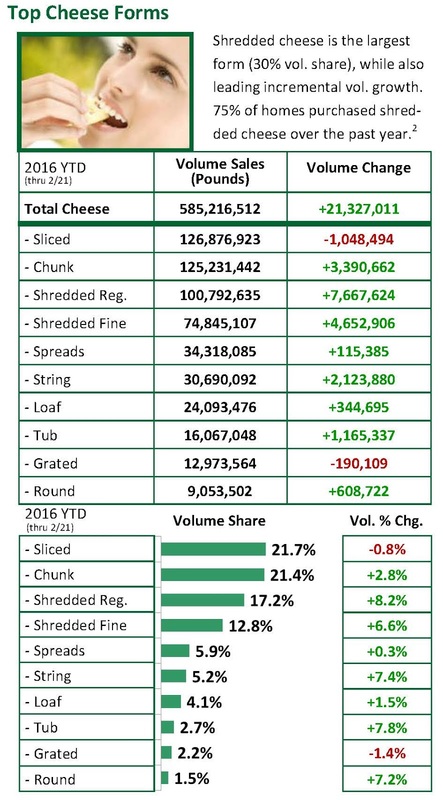 According to data from Chicago-based IRI provided to Dairy Management Inc., Rosemont, Ill., and courtesy of the Midwest Dairy Association, retail volume sales of cheese were up nearly 4% during the first two months of the year. String cheese, the most common snacking cheese form, represents a little more than 5% of retail volume sales and is up 7.4%. With consumers seeking cleaner labels and minimal ingredients, cheese is well poised to deliver more than its inherent protein and calcium. For example, careful formulation allows for cheese with higher protein content. Why not fortify cheese milk with vitamin D just like we fortify fluid milk? 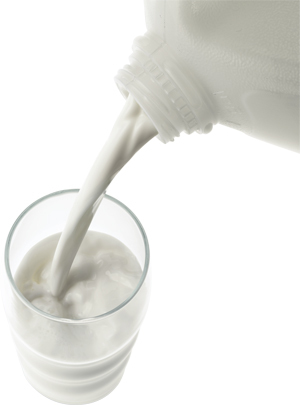 There is a strong parallel between the decline of milk consumption and widespread vitamin D and calcium deficiencies. Most consumers assume vitamin D is already in their cheese and it’s time for us to deliver a solution. After all, vitamin D is a nutrient of concern and cheese can deliver it. Adding probiotics is another option, as is making cheese with milk naturally higher in omega-3 fatty acids. Why not enhance snacking cheese with other better-for-you functional ingredients? The consumer is ready for something new in cheese. Check out this VIDEO about opportunities in cheese innovation. Here are some recent innovations. At only 70 calories, each Apollo’s Gift 100% Lactose Free Mozzarella Snack Stick gives you 6 grams of protein and 15% of your daily required calcium. And to top it off, Apollo’s Gift cheeses are loaded with beneficial probiotics. Marin Foods in Hong Kong offers bite-sized pieces of cheese in flavors such as almond and black pepper. 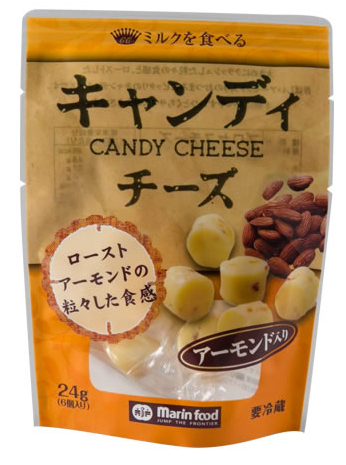 Called cheese candy, such a product is an ideal delivery vehicle for vitamin and mineral fortification. 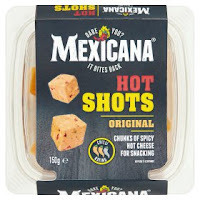 The same is true for the U.K. product Mexicana Hot Shots, which are cubes of spicy hot cheese that come in a resealable container. Kraft is building on its Stacked Cheese & Meat snacks that debuted a few years ago in single-serve 1.6-ounce bars in varieties such as Cheddar Jack and Bacon, Cheddar Pepperoni and Jalapeno, and White Cheddar Salami and Black Pepper. The snacks now come in five-pack bags. 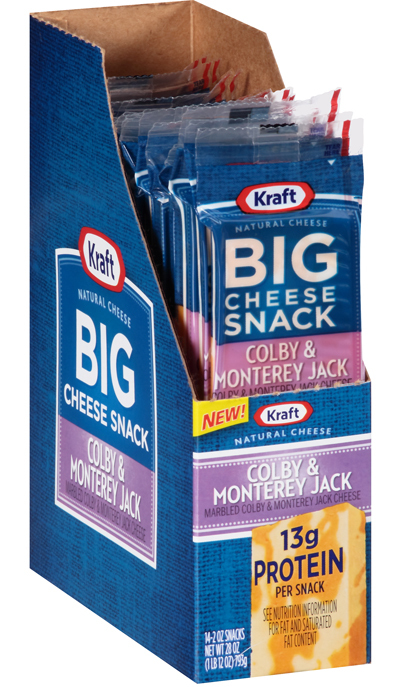 There’s also new Big Cheese Snack bars in varieties such as Colby & Monterey Jack, Mild Cheddar and Pepper Jack. Because such bars are designed to substitute for granola bar-type snacks, they should also come loaded with extra nutrition. There’s infinite opportunity to develop cheeses that speak to the needs of today’s nutrition-savvy, on-the-go, flavor-craving consumer. Cheese marketers must embrace the changing needs of the marketplace and give consumers what they want. That would be more cheese, with a dose of health and wellness. 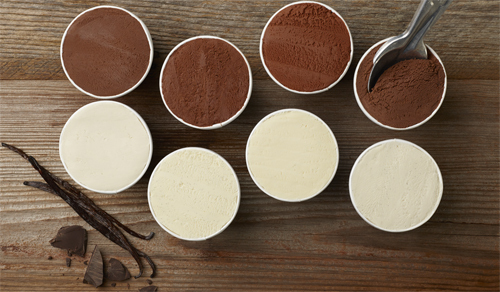 Ice Cream Trends: Consumers Crave Complexity, Yet Want Simple, Too. What’s an ice cream maker to do? The past two weeks’ blogs focused on flavor trends in ice cream innovations. I showcased the complex creations that consumers crave. To read about how brown flavors continue to evolve in the ice cream category, with caramel’s new best friends being the apple, the banana, the pear and the pineapple, link HERE. To read about reconstructing desserts into ice cream treats, link HERE. Clean-label marketing is all about transparency and disclosure. It often includes statements about what the product does not contain, which suggests that like products in the market do contain these ingredients. It’s about connecting with consumers on a personal level. It’s about artisan and hand crafted. 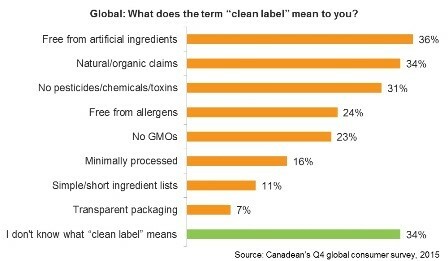 Clean-label formulating and clean-label marketing often go hand-in-hand. Some might refer to this as the real food movement. It incorporates health, animal welfare, social justice and environmental sustainability. Buzzwords associated with the real food movement include clean, local, green, and slow, as well as fair, organic and free-from. One thing to note with ice cream, the more complex the ice cream flavor, the less simple its ingredient statement. Careful ingredient selection can keep the ice cream real! The fact is, today’s consumers want products that are as close to nature as possible. Products made with ingredients that are understood, expected, authentic and easily pronounced. But they want their Oreo cookie, too! And Oreos require a few complex ingredients that keep it from being stocked by Whole Foods…and let’s be honest, those all-natural, organic Oreo wannabes don’t cut it. Caribou Coffee and Mars are the most recent big-brand players to embrace clean labelling, with the former committed to removing all artificial flavorings by the end of 2016, while Mars will phase out artificial colors from its food and drinks globally over the next five years. But with ambiguity surrounding the term, how much influence will such promises have on consumers? With ice cream, we must never forget that the benefit is enjoyment. 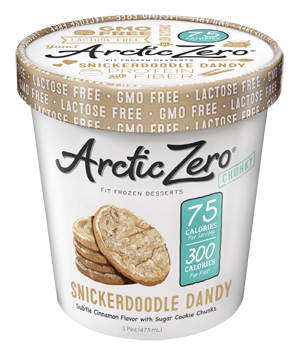 So how can ice cream brands align with the clean-label trend? The recent approach by U.S. coffee chain Caribou Coffee is a smart one, according to Felgate. Ben & Jerry’s has long been known for complexity, and its use of real, very flavorful ingredients. It avoids ingredients on Whole Foods’ unacceptable list, but has no problem embracing ingredients that assist with maintaining product quality and delivering flavor. This Unilever brand has also never been about organic, but in recent years has taken a free-from genetically modified ingredients stand. 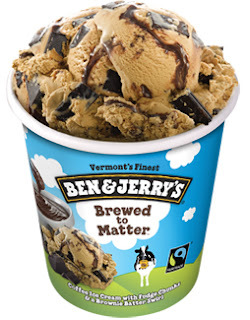 This is Ben & Jerry’s approach to clean-label formulating. The ingredient statement reads: CREAM, SKIM MILK, LIQUID SUGAR (SUGAR, WATER), WATER, SUGAR, COFFEE EXTRACT, COCONUT OIL, EGG YOLKS, DRIED CANE SYRUP, COCOA (PROCESSED WITH ALKALI), COCOA, BUTTER (CREAM, SALT), CORN SYRUP, WHEAT FLOUR, CHOCOLATE LIQUOR, CANOLA OIL, CARRAGEENAN, GUAR GUM, SALT, SOY LECITHIN, NATURAL FLAVOR, VANILLA EXTRACT, MILK FAT, SODIUM BICARBONATE. 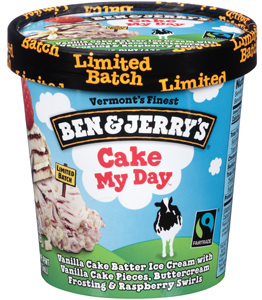 Limited-edition Ben & Jerry’s Cake My Day is vanilla cake batter ice cream with vanilla cake pieces, buttercream frosting and raspberry swirls. To achieve this complex flavor and still make the Whole Foods’ cut, the ingredients are: CREAM, SKIM MILK, WATER, LIQUID SUGAR (SUGAR, WATER), CORN SYRUP, SOYBEAN OIL, SUGAR, WHEAT FLOUR, DRIED CANE SYRUP, RED RASPBERRY PUREE, COCONUT OIL, EGG YOLKS, NATURAL FLAVORS, VANILLA EXTRACT, RED RASPBERRY JUICE CONCENTRATE, BUTTER (CREAM, SALT), PECTIN, VEGETABLE JUICE (COLOR), XANTHAN GUM, SOY LECITHIN, GUAR GUM, SALT, TURMERIC (COLOR), BAKING POWDER (SODIUM ACID PYROPHOSPHATE, SODIUM BICARBONATE, CORN STARCH, MONOCALCIUM PHOSPHATE), EGGS, CARRAGEENAN. For some ice cream manufacturers, clean label includes focusing on the craft. 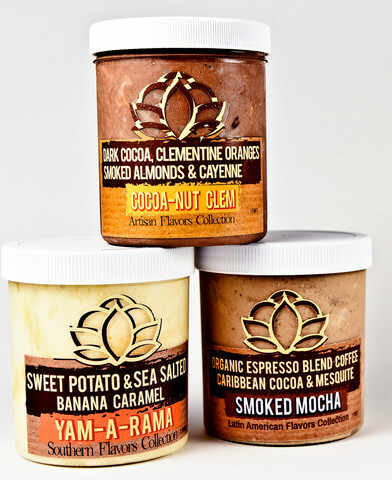 Last year, Häagen-Dazs rolled out the Artisan Collection ice cream line. 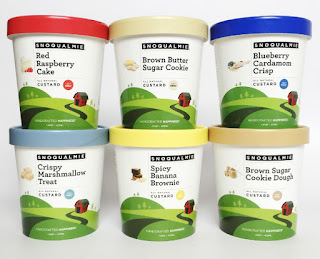 To create the six flavors, the brand teamed up with small confection makers from around the country to craft the gourmet ice cream flavors. For example, Sweet Cream Coffee Caramel was developed in collaboration with the small batch artisans at CC Made, Berkeley, CA. The ice cream combines swirls of sweet cream and coffee ice cream with thick ribbons of chicory coffee caramel for an experience rich with New Orleans flavor. The simple, yet still somewhat long, ingredient statement reads: SWEET CREAM ICE CREAM: CREAM, SKIM MILK, SUGAR, EGG YOLKS. COFFEE ICE CREAM: CREAM, SKIM MILK, SUGAR, EGG YOLKS, COFFEE. CHICORY COFFEE CARAMEL SWIRL: CREAM, CORN SYRUP, SUGAR, COFFEE, CHICORY EXTRACT (WATER, CHICORY), CARAMELIZED SUGAR (SUGAR, WATER), SEA SALT, PECTIN, BAKING SODA, SOY LECITHIN. CONTAINS: MILK, EGG AND SOY INGREDIENTS. 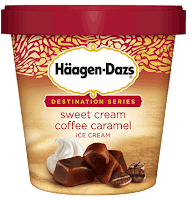 Häagen-Dazs, a brand of Nestle USA, has long maintained a simple approach to ice cream making, which includes using the purest and finest ingredients in the world and crafting them into the best ice cream, as stated on its website. Check out this trailer for Crafted, a documentary by award-winning director Morgan Spurlock and commissioned by Haagen-Dazs. Link HERE. 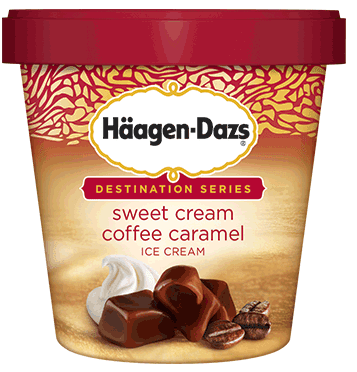 You may recall back around 2010, Häagen-Dazs became one of the first brands to take the simple approach to achieving a clean-label. 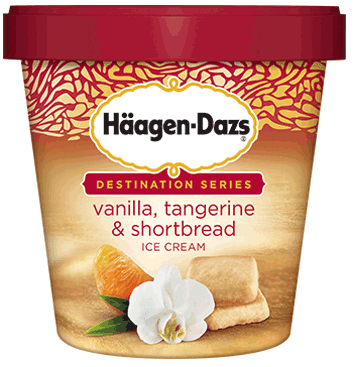 The Häagen-Dazs Five pint ice cream line focused on the simplicity and goodness of five ingredients: milk, cream, sugar, eggs and one flavoring ingredient. Five, of course, is not possible with complex flavors such as those in the Destination Series. For example, Vanilla Tangerine and Shortbread was developed in collaboration with the small batch artisans at Rare Bird Preserves, River Forest, IL. The flavor combines creamy vanilla ice cream with ribbons of sweet-tart tangerine curd and buttery shortbread cookies for a treat reminiscent of teatime in the U.K. The ingredients are: VANILLA ICE CREAM: CREAM, SKIM MILK, SUGAR, EGG YOLKS, VANILLA EXTRACT. TANGERINE SWIRL: SUGAR, EGG YOLKS, TANGERINE JUICE CONCENTRATE, BUTTER (CREAM, SALT), WATER, TANGERINE EXTRACT, SALT, LEMON JUICE CONCENTRATE. SHORTBREAD COOKIE PIECES: WHEAT FLOUR, BUTTER (CREAM, SALT), SUGAR, EGGS, SALT. CONTAINS: MILK, EGG AND WHEAT INGREDIENTS. Simpler flavors allow for simpler ingredient statements. 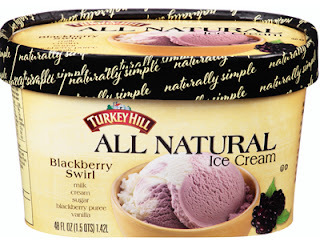 Turkey Hill is growing its All Natural Ice cream line. The ingredient statement for new Blackberry Swirl reads: NONFAT MILK, CREAM, SUGAR, BLACKBERRY BASE (WATER, BLACKBERRY PUREE, SUGAR, NATURAL FLAVOR, PECTIN, FRUIT AND VEGETABLE JUICE FOR COLOR), VANILLA. Other new flavors in the line include Black Cherry Fudge, Vanilla Almond Fudge and Vanilla Peanut Butter. Front labels all tout the inclusion of just five base ingredients. 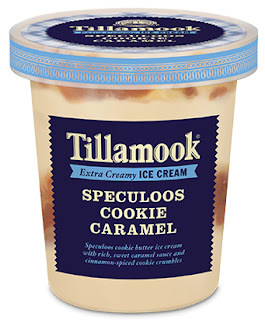 Tillamook has always been about clean-label ice cream. All of its ice creams are void of artificial preservatives, flavors, colors, sweeteners and high fructose corn syrup. But again, to develop a complex superpremium flavor such as Speculoos Cookie Caramel, the ingredient list is going to have to be long. It reads: Cream, Skim Milk, Sugar, Speculoos Cookie Pieces (cookie pieces [enriched flour (wheat flour, niacin, reduced iron, thiamine mononitrate, riboflavin, folic acid), sugar, butter (cream, salt), brown sugar, invert sugar, soy flour, cinnamon, salt, sodium bicarbonate], coconut oil), Caramel (rice syrup, milk, water, sugar, nonfat dry milk, butter (cream, salt), pectin, sodium citrate, salt, sunflower lecithin), Speculoos Cookie Butter (speculoos cookies [wheat flour, brown sugar, vegetable oil (palm, canola, and coconut oil), sugar, soy flour, invert sugar, baking powder, cinnamon, nutmeg], vegetable oil [canola and palm oil], sugar, rapeseed lecithin), Speculoos Cookie Butter Base (water, sugar, butter [cream, salt], brown sugar, natural flavor, corn starch, salt, spice, beta carotene [color]), Locust Bean Gum, Guar Gum. Even organic ice cream often relies on assistance from natural hydrocolloids to maintain quality during distribution and freeze-thaw cycles. For example, Humboldt Creamery is going national with its superpremium organic ice cream. Mint Chip’s ingredient statement reads: organic cream, organic sugar, organic condensed milk, organic chocolate flavored chip (organic dried cane syrup, organic coconut oil, organic cocoa powder, organic soybean oil, organic cocoa liquor, organic soy lecithin), natural organic peppermint extract (organic alcohol, organic peppermint extractives), organic stabilizer (organic locust bean gum, organic guar gum, organic dried cane syrup). Hope to see you in Florida this week at the International Dairy Foods Association’s annual Ice Cream Technology conference. For more information, link HERE. Pints are powerful! They cost more--often a lot more--than larger-sized ice cream containers. In fact, numerous artisan, hand-crafted brands command as much as $10 per pint at retail. Such smaller-sized containers, though more expensive, invite consumers to try something new…less product, less risk of waste in case you don’t like it. But what’s not to like? Innovative flavor systems, premium inclusions, textured variegates and out-of-the-box product development is making this summer’s ice cream menu one of the best in a long time. If you missed last week’s blog on how brown flavors continue to evolve in the ice cream category, with caramel’s new best friends being the apple, the banana, the pear and the pineapple, link HERE. Think of classic desserts involving butter and brown sugar. Now think of the fruits in those desserts and why they partner so well with caramel…caramel with spice, with heat, with a twist. Let’s expand on the idea of desserts. Cakes concepts are hot in ice cream. I’m not talking simple cake batter flavor with some festive sprinkles. I’m talking reconstructed cake by layering flavors and real cake pieces or swirling cake ingredients into an ice cream base. And as cookies become the next cupcake in the bakery scene, this trend is trickling over to ice cream. I’m not talking chocolate chip cookie dough. Think reconstructing a snickerdoodle, speculoos over even a Rice Krispie treat. I challenge an ice cream manufacturer to create a line such as State Fair Favorites. 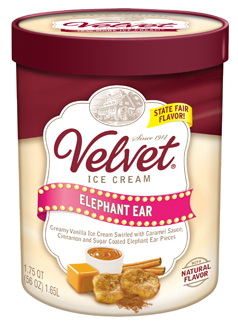 Last year, Velvet created Elephant Ear Ice Cream exclusively for the week-long Ohio State Fair in August. Demand inspired the company to re-launch the flavor this summer, adding Elephant Ear Ice Cream to its permanent lineup of flavors. This one-of-a-kind frozen confection starts with Velvet’s creamy traditional vanilla recipe, to which swirls of rich caramel sauce and crispy nuggets of fried, cinnamon-coated elephant ears are added. Read more about it HERE. Why not a line of state fair favorite flavors from around the country? Wisconsin can be cream puff and Illinois something with buttered corn. I’m sure Florida would be tropical while Texas would have some heat. Colorado would be beer…or if kept in state, maybe “edibles.” What fun for consumers to be able to taste the flavors of different states without traveling! How about creating a flight of flavors for comparative tasting. It’s been done in cheese. Think Sargento’s Tastings (link HERE) and Cabot’s Founder’s Collection (link HERE). Here’s some flight ideas: cherry varietals, chocolates, coffee roasts and vanillas. Choctál does this. The company uses chocolates and vanillas grown around the world, allowing consumers to experience unique and distinct flavor profiles of ice cream. Read more HERE. Looking for ice cream flavor ideas? Plan to attend the International Dairy Foods Association’s annual Ice Cream Technology conference April 12 to 13 in Florida. I will help kick off the meeting with a presentation on global ice cream insight and innovation ideas. For more information, link HERE. Check out all these new products. Breyers has brought families together over frozen treats since 1866. 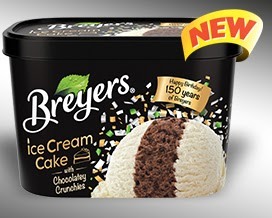 In celebration of its 150-year anniversary, Breyers is introducing a full-frozen twist on ice cream cake. New Breyers Ice Cream Cake offers Breyers Chocolate Ice Cream and loads of chocolatey crunchies sandwiched between Breyers Natural Vanilla Ice Cream. 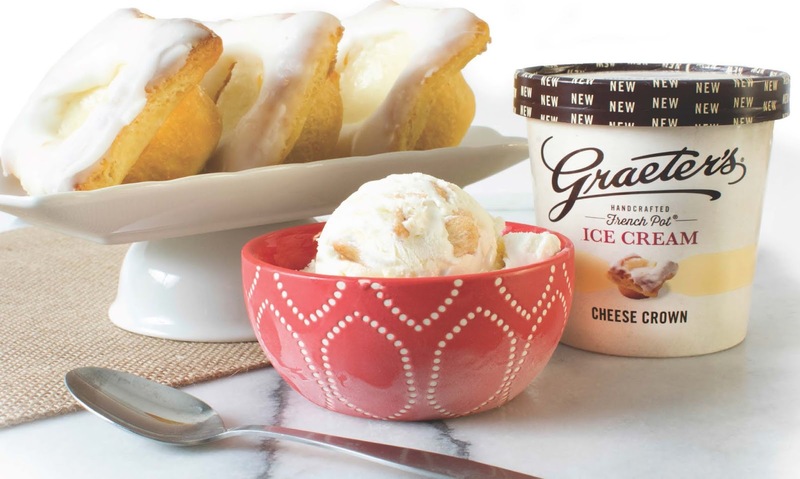 Graeter’s newest flavor is Cheese Crown, which is based on the cheese crown danish, a Cincinnati bakery tradition for more than half a century. The cheese crown is a danish roll filled with cream cheese and cinnamon streusel. Graeter’s new Cheese Crown ice cream pays homage to this popular baked good with a rich cream cheese base along with crunchy cinnamon pastry pieces and fondant icing flakes. 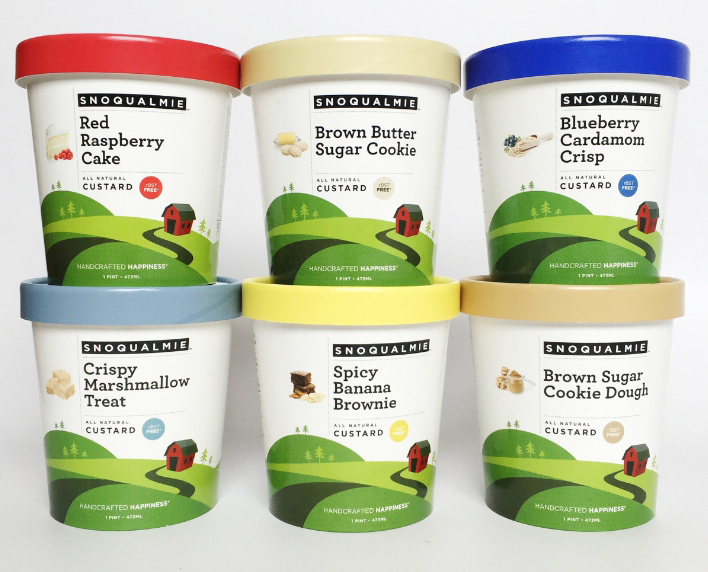 Snoqualmie Ice Cream from the Pacific Northwest has launched six new, all-natural frozen custards. The innovative flavors speak to many of the themes I identified, including recreating desserts, celebrating traditions and sneaking in little surprises. The frozen custards contain 14% butterfat, more cream and extra eggs. Snoqualmie Ice Cream is made in a sustainable factory north of Seattle. The pints are vat-pasteurized in small batches and are all natural, rBST-free and sweetened with non-GMO cane sugar. Brown Sugar Cookie Dough Custard: Creamy custard sweetened with brown sugar and extra bites of chocolate chip cookie dough. 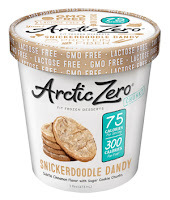 Arctic Zero Fit Frozen Desserts are all about less fat and fewer calories. The brand recently added seven craveable new additions to its family of zero-guilt treats. In the Chunky pints line there’s Banana Pudding, Brownie Blast and Snickerdoodle Dandy. In the Creamy pints line, there’s Cake Batter and Poppin’ Pomegranate. In novelties, there’s Mint and Salted Caramel Chocolate-Dipped Bars. 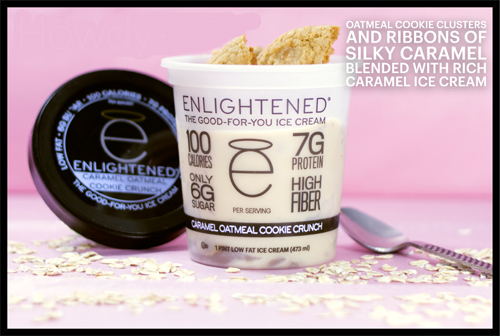 Enlightened is rolling out pints of “the good-for-you ice cream,” including two cookie concepts. Caramel Oatmeal Cookie Crunch is oatmeal cookie clusters and ribbons of silky caramel blended with rich caramel ice cream and Chocolate Chip Cookie Dough is chunks of soft chocolate chip cookie dough and rich chocolate chips blended with sweet cream ice cream. There’s also Frozen Hot Cocoa, Mint Chocolate Chip, Peanut Butter Chocolate Chip, Sea Salt Caramel and Triple Chocolate. A half-cup of the new pint flavors contains 80 to 100 calories, 1.5 to 4.5 grams of fat, 7 to 8 grams of protein and 4 to 6 grams of sugar, depending on variety. All flavors deliver 5 grams of fiber per serving. The pints join the company’s existing novelty line, which debuted about three years ago. Read more about them HERE. Both concepts are all about providing protein and fiber with less sugar and fewer calories. 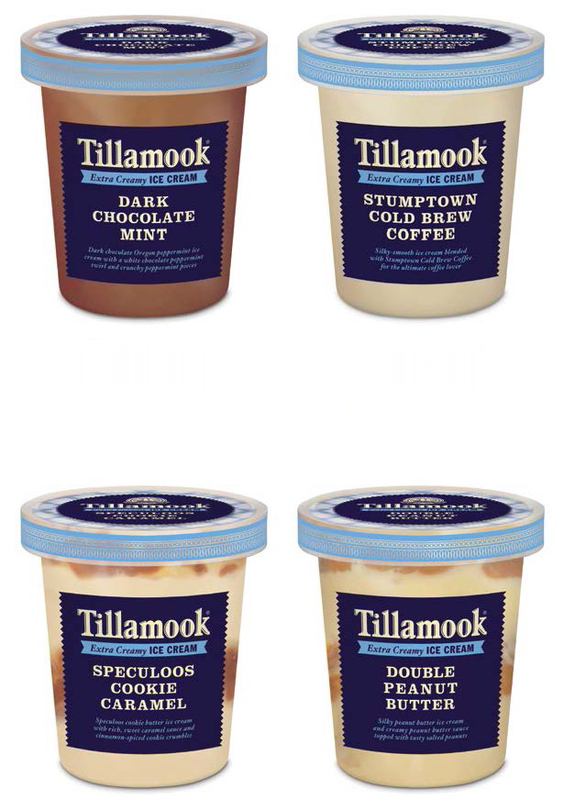 Tillamook is growing its frozen desserts business with pints, a format consumers have been requesting from Tillamook for quite some time, according to the company. Since 1947, the farmer-owners of Tillamook have packed ice cream with extra cream, not extra air, ensuring each scoop is really smooth and creamy. And it’s made the Tillamook way; with no artificial preservatives, flavors, colors, sweeteners or high fructose corn syrup. The gelato line includes: Authentic Sweet Cream (made with buttermilk), Chocolate-Covered Strawberry, Oregon Hazelnut Chocolate, Salted Caramel Toffee, TCHO Double Dark Chocolate and Toasted Coconut Fudge. 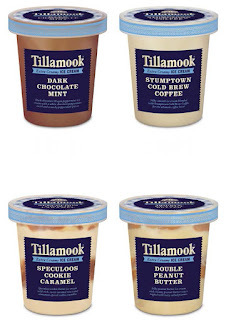 The Extra Creamy ice cream line includes: Dark Chocolate Mint, Double Peanut Butter, Speculoos Cookie Caramel and Stumptown Cold Brew Coffee. The frozen custard line includes: California Peach Cobbler, California Pistachio, Chocolate Fudge Brownie and Oregon Marionberry Cheesecake. All varieties are made with locally sourced ingredients whenever possible, which are often called out on packages. Stumptown is a popular Portland, Ore.-based coffee roaster. TCHO is a craft chocolate make in Berkeley, Calif. The TCHO chocolate used in the gelato is 70% dark chocolate made with sustainably sourced cocoa. In Brooklyn, N.Y., Lotus Scoop is all about adding little surprises to its hand-crafted artisan ice creams. For example, Cocoa-Nut Clem is premium chocolate ice cream that is so dense, it is literally fudge-y” when it starts to melt, according to the company. It is made with the company’s signature organic Caribbean cocoa powder that gets doubled down with dark, raw cacao to develop the cocoa fudge base. Cocoa-Nut Clem is one of the company’s most labor-intensive flavors because it requires cleaning and peeling tons of fresh Clementines by hand, juicing the inside fruit and then cooking the zest. The result is a flavorful and fragrant dessert sauce, which when mixed with the intense fudge ice cream, yields a familiar Mandarin orange chocolate flavor reminiscent of Godiva chocolates. Here’s the little surprise, a touch of cayenne pepper and roasted almonds are added to finish off what is already a very complex and layered flavor. Yam-A-Rama is said to taste like a frozen sweet potato pie. 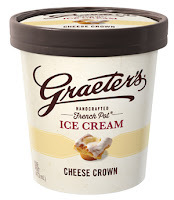 It is one of the company’s most popular ice cream flavors. 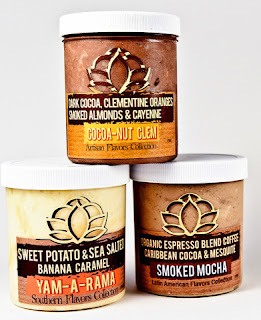 It is a buttery mash of baked sweet potatoes and cinnamon swirled into ice cream base with generous amounts of homemade banana caramel with hints of Himalayan pink salt. Smoked Mocha combines the very robust Marley Coffee’s Fair Trade Lively Up espresso with the company’s signature organic Caribbean cocoa into ice cream base that gets layered with an organic mesquite powder to give the ice cream a unique smoky flavor. According to the company, mesquite is derived from a flowering Southwestern tree and its wood gives off a flavor that is less potent than hickory, so it is perfect for giving an already strong and mocha ice cream depth and character. Ben & Jerry’s third installment of its Core innovation line is rolling out this month. With a twist on some classic baked goods, the three new flavors feature decadent chunks and swirls that will be sure to satisfy even the sweetest tooth. The new offerings are: Brownie Batter (chocolate and vanilla ice creams with fudge brownies and brownie batter core), Coconuts for Caramel (caramel and sweet cream coconut ice creams with fudge flakes and caramel core) and Cookies & Cream Cheesecake (chocolate and cheesecake ice creams with chocolate cookies and cheesecake core). 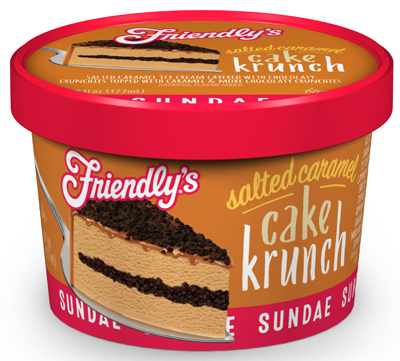 Cake sundae concepts include Chocolate Cake Krunch (layers of chocolate ice cream separated by chocolaty crunchies, all topped with fudge and additional chocolaty crunchies), Salted Caramel Cake Krunch (two layers of salted caramel ice cream separated by a layer of chocolaty crunchies topped with caramel sauce and more chocolaty crunchies) and Strawberry Cake Krunch (layers of strawberry and vanilla ice cream separated by a layer of pink and white vanilla crunchies, topped with strawberry sauce, whipped topping and more crunchies). Here’s something you don’t see every day, but it’s just the type of tradition that can be recreated into a packaged product. South Tampa’s quirky and whimsical bistro and bakery Dough by Datz now offers its version of the Czech internet sensation: Doughnut Ice Cream Cones. Dough’s version of the infamous deep-fried spirals of sugar-coated goodness are made fresh daily and served while supplies last. 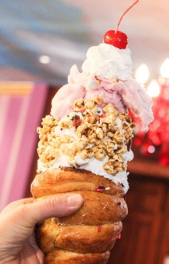 The flaky cones can be filled with doughnut-flavored soft-serve ice cream, with flavors varying weekly. For its mouthwatering Florida debut this week, the Doughnut Ice Cream Cones are being filled with creamy swirls of house-made jelly doughnut-flavored ice cream. Toppings include bacon caramel popcorn, cotton candy, whipped cream and a cherry. This adventurous alternative to the classic cone is credited to Good Food Coffee and Bakery cafe in Prague, whose fried sensation took over the internet in February, drawing the attention of foodies on every social media platform and major news outlet. These specific desserts, inspired by the Czech trdelník, include a cone made from actual doughnut dough, a Nutella lining and soft-serve ice cream. If the weather was not so questionable in the Midwest this week, I’d be on plane to get me one! Hope to see you on the opposite coast of Florida in a few weeks at the International Dairy Foods Association’s annual Ice Cream Technology conference. For more information, link HERE.